Major League Soccer’s expansion timeline came into further focus on Monday as Los Angeles FC announced its plan to construct a stadium on the site of the Los Angeles Memorial Sports Arena, which is adjacent to the Los Angeles Memorial Coliseum and about five miles south of downtown. The expansion team expects to begin play in its new facility in 2018. MLS commissioner Don Garber confirmed the timing at a Monday afternoon news conference. The new, 22,000-seat, natural grass venue will anchor a larger complex expected to include restaurants, retail, conference space and what LAFC co-owner Henry Nguyen called a “world football museum” that will be “unique to both North and South America.” The entire project will require $250 million in private investment, according to an LAFC news release. ​The club originally was scheduled to enter MLS in 2017 alongside the unnamed Atlanta franchise, but the scope of the Exposition Park stadium project has pushed the timeline back. According to a Sunday report in the Los Angeles Times, the additional year is required in order to complete an environmental impact assessment and demolish the Sports Arena, which was home to the Los Angeles Clippers in 1984-1999, the Lakers in 1960-1967 and numerous other teams. The LA Galaxy play 12 miles to the south at the StubHub Center in Carson. LAFC said Monday that it’s operating under “tight deadlines” and must meet “a series of benchmarks by the end of July.” The club called on the city council to “to act quickly to complete environmental reviews, entitlements and infrastructure investment to make the project feasible at this location.” No money from LA’s general fund will be used, the club said, but there will be discussions with the city and state "to identify opportunities that the project will be qualified for under their guidelines." LAFC’s ownership group, led by Nguyen, former NBA executive Tom Penn and Mandalay Entertainment chairman and CEO Peter Guber, had indicated that progress on a stadium was needed before the club settled on a brand. The Times on Sunday quoted Penn, LAFC’s president, as saying, "It became clear we had to make this decision first. Because then every other decision became easier." As of now, LAFC is expected to stick with that name and the black and red colors featured prominently at Monday’s event, on the stadium renderings and on its website. Last week, LAFC announced the hiring of COO Carl Schloessman, a local entertainment executive. It remains to be seen whether the 2018 launch will have a domino affect on other incoming expansion teams. Whether Atlanta starts alone in 2017 now likely depends on Minnesota United, the NASL club that was awarded an MLS slot in March. Although the league initially said United would come aboard in 2018, commissioner Don Garber then told reporters, “It could be as early as 2017 … We have a number of moving pieces. That’s part of the dynamic with a young sports league. The target is no later than ‘18 and it could be as early as 2017." United has committed to building an 18,500-seat, outdoor, soccer-specific stadium next to the Minnesota Twins’ Target Field in the North Loop neighborhood of Minneapolis. While the club has promised to put $120 million toward facility construction and another $30 million toward the purchase of the property, its request for the sales and property tax relief awarded to other local stadium projects still hasn’t been approved. Thus, there’s no guarantee regarding the potential stadium’s timeline. Could United start life in MLS in 2017 at its current home, the 8,500-seat National Sports Center in suburban Blaine? Upgrades on seating and lighting would be required. It would be a similar setting to Buck Shaw Stadium, where the San Jose Earthquakes played from 2008 through last season. The strength of United’s existing brand and fan base might make that feasible. But there’s no guarantee the club will be allowed to keep that brand. Existing teams entering MLS from another league have changed their logo for trademark reasons, and there’s some concern at MLS that two teams called ‘United’ might create confusion. The schedule regarding David Beckham’s Miami franchise is even less clear. The group continues to pursue a stadium site, without which the club will not be given the green light. Although land next to Marlins Park in Little Havana is available, Beckham and his partners so far have refused to settle on that location and are continuing their search. MLS has committed to fielding 24 teams by 2020. 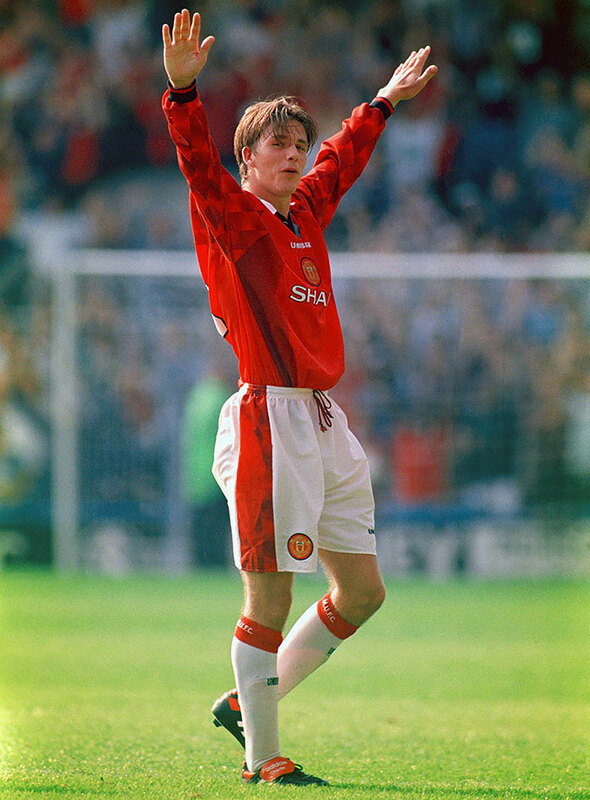 After signing with the club as a trainee in 1991, Beckham made his first-team debut for Manchester United at age 17 as a reserve in its second round Rumbelows Cup match against Brighton & Hove Albion. 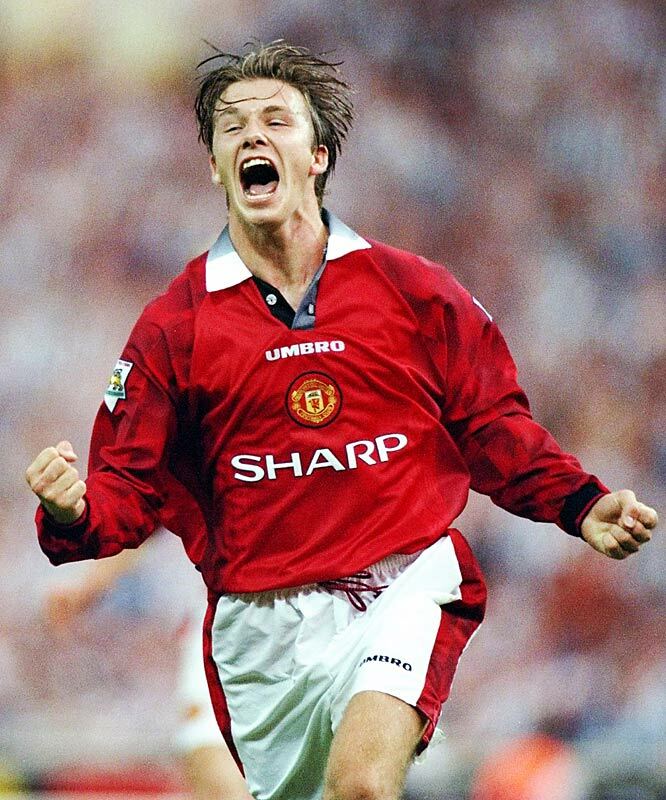 In a 1994 Champions League match against Galatasaray, Beckham scored his first goal for Manchester United — one of more than 80 goals he would score for the club in 12 years. 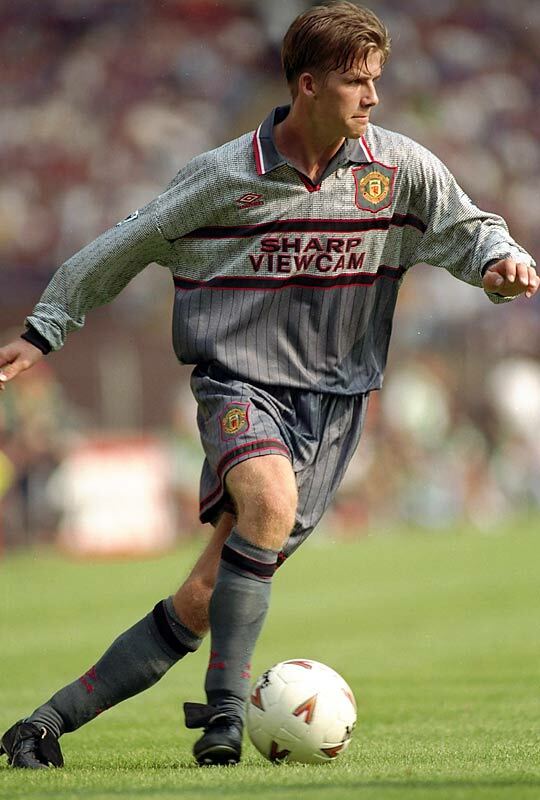 One of Beckham's most beautiful goals took place on Manchester United's first day of the 1996 season against Wimbledon. Man U was up by two when Beckham got the ball inside his own half. His eyes darted up for a second before he shot from midfield. The ball went sailing over Wimbledon goalkeeper Neil Sullivan's head and crashed into the back of the net. Two weeks later he played in his first game with the English national team. 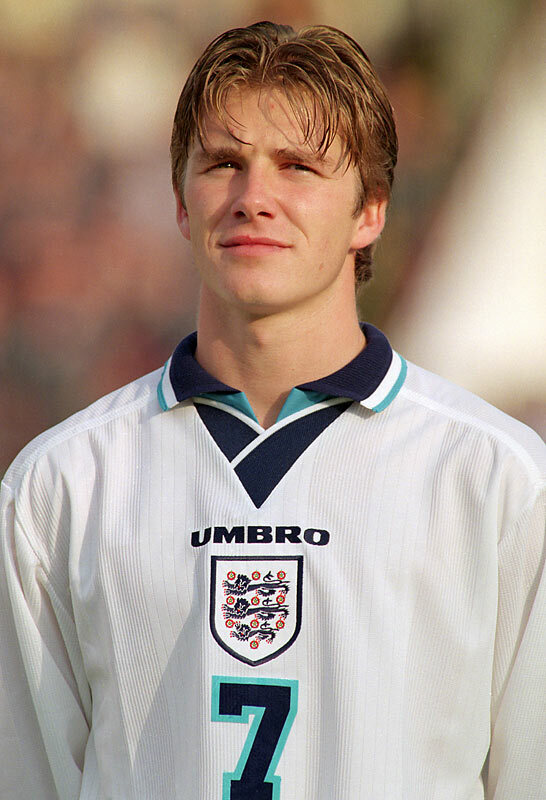 A 21-year-old Beckham made his international debut in a World Cup qualifying game against Moldova in September 1996. The newcomer hid his nerves well, and England snagged the much needed 3-0 win. Over these two seasons, Beckham and Man U won back-to-back Premier League championships. 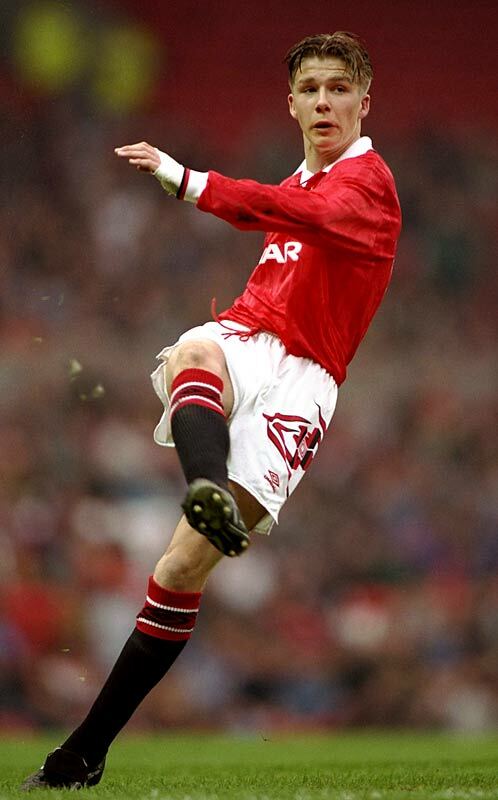 During the second campaign, Beckham was named 1996 PFA Young Player of the Year and finished second in voting for Player of the Year. 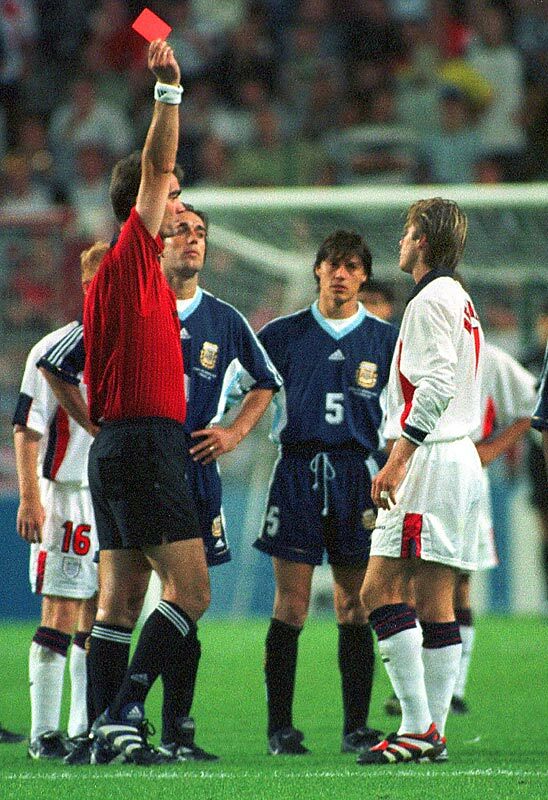 Beckham received a red card and was sent off against Argentina in the second round of the 1998 World Cup after kicking out at Diego Simeone. The tantrum caused a massive public and media outcry. Many fans blamed him for ruining England's shot at winning a World Cup. 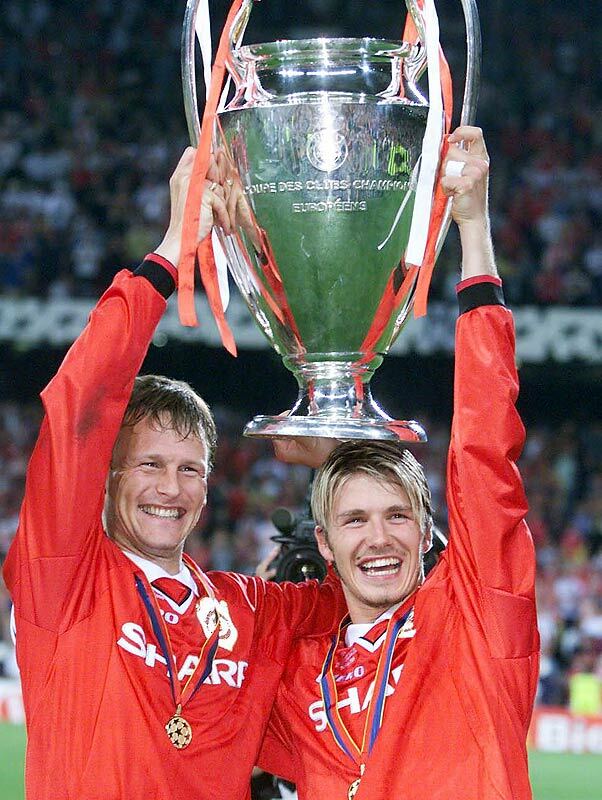 Playing in a career-high 52 games, Beckham and Man U completed the historic treble, winning the Premier League, FA Cup and, in a historic final, the UEFA Champions League (where two late goals set up by Beckham pushed United past Bayern Munich 2-1). Beckham was named runner-up for the 1999 FIFA World Player of the Year award (and would be again in 2001). Beckham caused quite the British tabloid frenzy in 1999 when he wed British pop-sensation Victoria Adams, otherwise known as Posh Spice. Posh and Becks soon became the most famous celebrity couple in the world. With only seconds left on the clock, England was trailing Greece 2-1 in the game that would determine England's inclusion in the 2002 World Cup. Beckham saved the day for the Three Lions. As millions of fans held their breaths, the team captain curled in a free-kick to force the draw and secure a place for England in South Korea/Japan. Beckham made up for his 1998 red card by scoring the game's only goal vs. Argentina, a penalty kick in the 44th minute, in the 2002 World Cup. The win revived England's hopes of advancing from group play and ended up preventing the heavily favored Argentines from doing so themselves. In April 2002, Beckham fractured a metatarsal in a Champions League quarterfinal game against Deportivo La Coruña. The famed injury made the term 'metatarsal' a colloquial, household name. Beckham was left with a cut over his left eyebrow after a locker-room feud with Manchester United manager Sir Alex Ferguson in 2003. The altercation sparked rumors of a summer transfer for Becks. After 12 years, six Premier League titles, two FA Cups and the 1999 UEFA Champions League title, Beckham left Manchester United, signing for Spanish rival Real Madrid in a $25 million deal. Since club captain Raul already wore No. 7 jersey (Beckham's number for Man U), Becks chose to wear No. 23 in honor of his favorite basketball player, Michael Jordan. Beckham sent an embarrassingly high shot over the bar during the 2004 European Championship as the quarterfinal went to penalty kicks. Beckham's shank cost his team the game as Portugal won the shootout 6-5. England's Euro 2004 run came to a screeching halt and Beckham was stuck defending his position as captain. In 2004, France Football magazine named Beckham the highest-paid soccer player in the world, citing earnings of approximately $27 million. The sum put Becks above fellow stars Ronaldo, Zinedine Zidane, Raúl and Roberto Carlos. 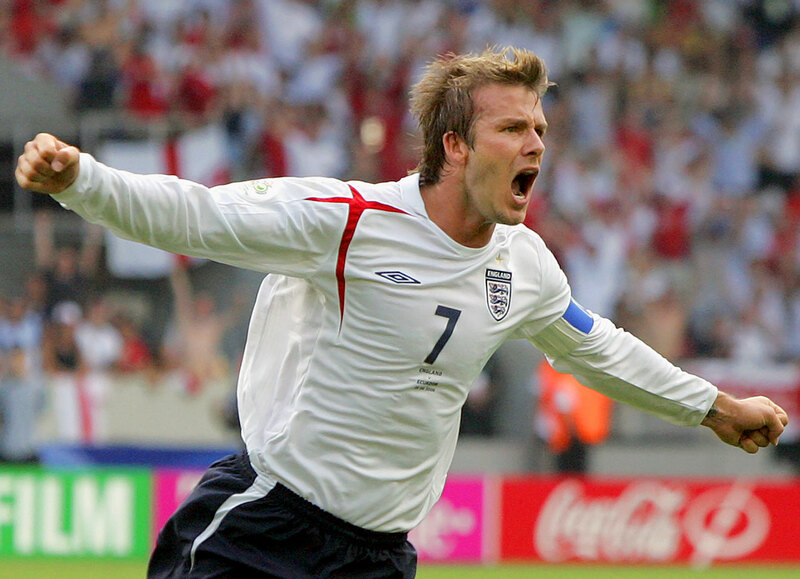 Beckham became the first English player to score in three World Cups. England's superstar team captain took a free kick after Frank Lampard was fouled in the Round of 16 vs. Ecuador in 2006. His shot curled over the wall and banked in off the post to give the Three Lions the 1-0 win. Beckham stepped down as captain of the England national team after his third World Cup in 2006. "The time is right to pass on the armband as we enter in a new era," he said. In 2007, Beckham left European soccer and Real Madrid to play in the U.S. for the Los Angeles Galaxy of Major League Soccer. He agreed to a five-year deal with the Galaxy and joined the Hollywood in-crowd in L.A.
On Aug. 15, 2007, a week after his MLS debut, Beckham and the Galaxy faced off against D.C. United in the SuperLiga semifinals. It was a game of firsts for Beckham: first start, first game as captain and first yellow card. He also recorded his first goal (off a free kick, of course) and assist. 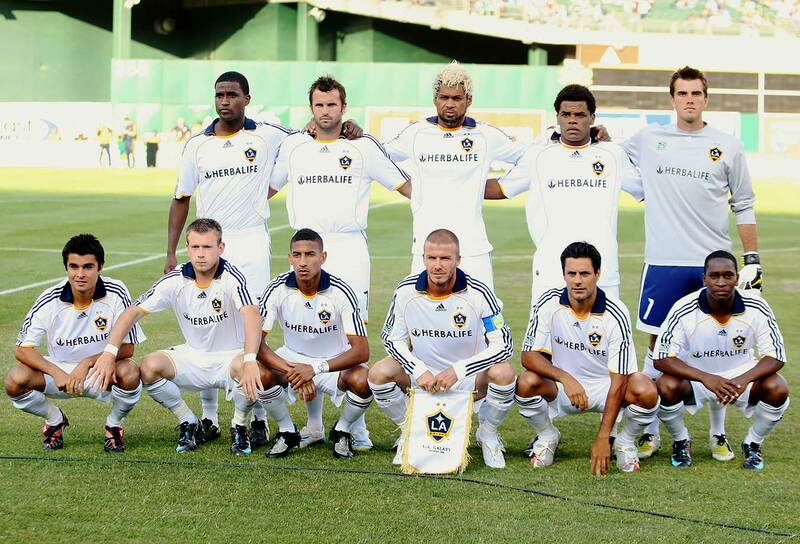 His efforts gave the Galaxy a 2-0 victory, earning them a birth in the final against Pachuca of Mexico. Beckham swaps jerseys with New Orleans Saints running back Reggie Bush in 2007 in an Adidas promo during his first season with the LA Galaxy. Beckham became the fifth Englishman in history to earn 100 caps with his national team in March 2008. Beckham scored on an empty net from 70 yards out in a game against the Kansas City Wizards in 2008 (his second career goal from his own half). The Galaxy took the game 3-1, pushing them to their first winning record in two years and into first place in the Western Conference. By mid-2008, as the team struggled, rumors began to surface about growing distance between Beckham and his teammates. More, questions arose about Beckham's effectiveness as team captain. The Galaxy failed to qualify for the playoffs that season. In October 2008, AC Milan announced that Beckham would join its team on loan until January. Amidst speculation, Beckham said he intended to return to the Galaxy in time for the start of the season. But, after scoring two goals and two assists in his first five games for Milan, Becks announced that he wanted to leave the Galaxy for good. Beckham finished out the Serie A season in May and will rejoin the Galaxy this month, midway through the MLS season. Beckham would have two stints with Milan — one in 2009 and another in 2010 — and received a mixed reaction from fans upon his return to Los Angeles. Both times, however, Beckham led the Galaxy to a Western Conference title. Beckham played out the final year of his five-year deal in 2011 and the 36-year-old turned in the best season of his MLS career. He finished second in the league in assists (15) and led the Galaxy to the MLS Cup. Beckham remained mum on his future, but many speculate he played his final match in the MLS. 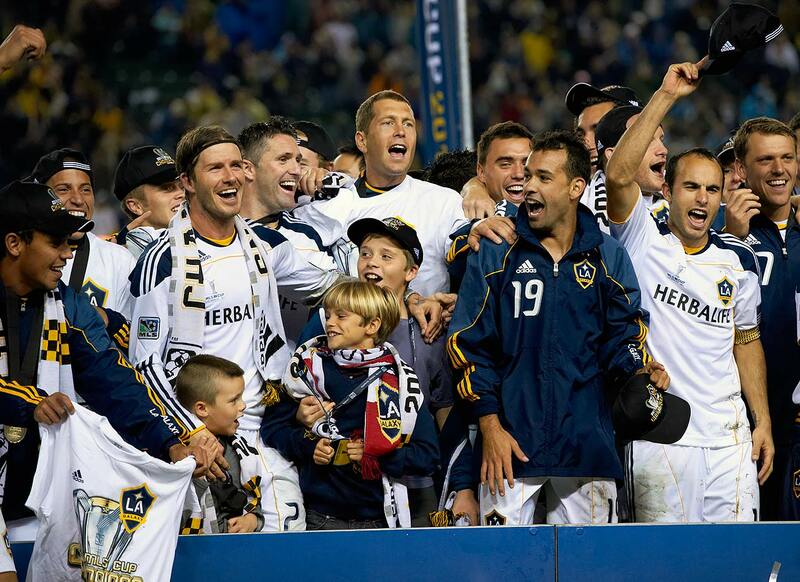 Beckham, who had said that the 2012 MLS Cup would be his last game with the Galaxy, ended his MLS career on a high note. He helped the Galaxy win their second consecutive MLS Cup, again defeating the Houston Dynamo in Los Angeles. Beckham joined French superclub Paris Saint-Germain in February 2013. On May 16, having started just four games for the club, including a Champions League quarterfinal match against Barcelona, the 38-year-old Beckham announced he would retire at the end of the season. "I'm thankful to PSG for giving me the opportunity to continue but I feel now is the right time to finish my career, playing at the highest level,'' the former England captain said in a statement. In his final match before retiring, Beckham was made captain and wore a special pair of boots (inset) he designed himself with the names of each of his four kids and the shirt numbers he wore throughout his career. 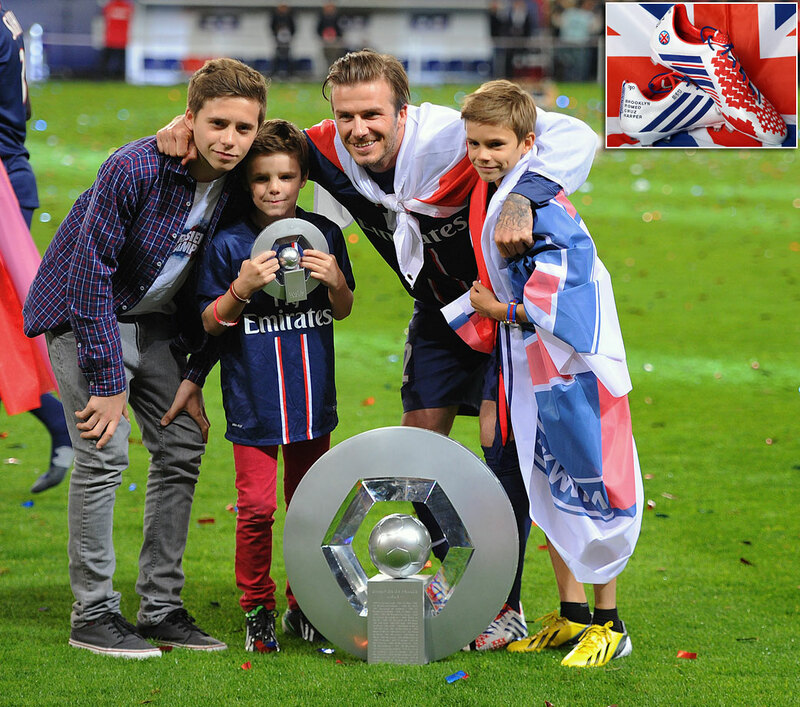 Beckham assisted on a goal as PSG won 3-1 against Brest on May 17, 2013. Beckham announced in February 2014 that he had exercised his option to buy an MLS expansion team, and the proposed location for the team is Miami. Beckham is enamored with Miami's waterfront, strongly believes in South Florida as a soccer market, and feels a stadium in the heart of the city with a view of the skyline is ideal. Beckham is named the “Sexiest Man Alive” for 2015 by People magazine. He is the first professional athlete to win the Sexiest Man Alive mantle since the magazine began handing it out in 1985. 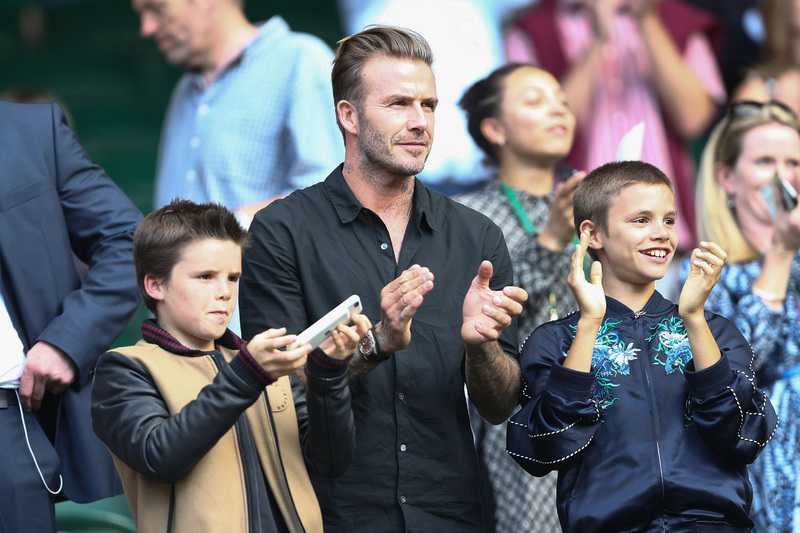 Beckham takes in one of Roger Federer's matches at Wimbledon 2016 with his sons Cruz and Romeo.